The Occu'thar monopoly plan is canceled, because of another game-breaking bug: an offline player stays in the raid, cannot even be reported AFK (can be but no effect) and takes a spot. So hordies can just queue up, log out inside and win. On PvE front: activity decreased, but it doesn't stop us to raid with the new people who haven't seen BoT/BWD yet. On PvP front: we ran about 20 matches last week. Still we are hindered by the fact that on every win 1-3 people get the "win your first rated BG" achievement, showing that we have pretty high turnover (also pretty high pool). "do X challenges" achievements: can't be hurried as the challenges are weekly capped. The Daily Grind: 56% and it would be insane to pay for them. People will do TB dailies anyway for the resistance trinket. Soon 4.2 will bring brand new dailies. Rating-related PvP achievements currently out of reach, Are you not entertained? prize is still 5000/G person. I looked around and the server is a PvP backwater. There are barely any such teams here. So here a PvP title is very unique, if you want to be the "best PvP-er of the server", it's a transfer away. Now that's a Teamwork: 42%, now that we play rateds a lot, it will be done soon. Creepjackers: 59%, will be completed on its own, the new TB strategy increases it pretty fast. We are legendary: meta for the above ones for 25 points. Heroic raid achievements: Since they will keep giving valor points (like normals in Firelands, I guess they will be done soon). Master Crafter: 84% but crafting epics just to DE would be simply insane. We're Gonna Need A Bigger Boat: 88%, since I figured out that fishing is actually profitable, people are doing it. We are looking for both raiders and PvP-ers, to increase these activities. Currently we can do either but not both as we don't have enough people to have 10 on a hard mode, 10 on farm, other 10 in RBG. So if you got enough of "we'll start raiding/rBG soon" guilds, join us, as we are already doing them, just with not enough intensity. Of course keeping the rules is a must. How is that a game breaking bug when the option is open to both sides? If you want to sabotage the horde, you can do that too! Because the outcome is totally uncorrelated to strategy, skill or even gear. It simply comes down to "who have more lvl 85 opposing side alt". While you are right that this is still an even game, it's not something that anyone would play seriously. And how is that different to your 'strategy' of recruiting lolkids from the Horde side? It is a game breaking bug because the exploit allows one to actively hinder the opposing team via gameplay. This is different from recruiting on opponents trade because then the recruiter does not participate in the as saboteur. It is more similar to joining the opposing team, and sabotaging e.g. by moving the siege engine into a remote area. This exploit is arguably worse: the player can log to their faction character (or yet another alt) and exploit even further. And the Horde have enough organisation to pull off a victory like that? A couple of offline players won't lose the battle if its not close already. Squish, it's not really different but it's different to Gevlon because he didn't come up with the idea it's just part of the game. I can appreciate where he's coming from because he seems to enjoy beating the game in original and unique ways, that's where he gets his fun. We all pay our subscriptions and enjoy whatever we enjoy from the game. You can't hold that against him even if he holds it against others. Squishalot, are you claiming that the fact that lolkids can join the opposing team is a game-breaking bug? I don't pvp and I don't get the bug, can anyone please explain it to me? At the start of the battle even numbers of players join it, then half of one team logs out and then what? Join with their mains so the number is even again? I don't get it. @ Alrenous: No, I'm claiming that it's even on both sides. It's not 'game breaking' when the option to abuse it is available to both parties. It's a bug, certainly, but it's not 'game breaking' as a result. That is why I can say it's exactly the same as recruiting lolkids - as far as 'game breaking' is concerned, they're both equally effective, and so, it's not a sufficiently good reason for Gevlon to call things off. @ chewy: That's not going to stop us from pointing it out, of course. "you actually have to fish in pools that are marked on the map if you track fish, normal fishes are not counted :D (explains the lack of progress here )"
True, but the statement is correct: fishing, in general, is profitable. It was in WotLK, and it still is in Cata. The highest profitable fish are not always fished from pools. If you are leveling fishing, fish from pool you will get a guaranteed hit whereas if you fish outside of pool, your fishing skill is taken into account. @ chewy, participating in the fight (then DC or playing bad with sieges) is actively working against the opposing team via gameplay, while letting friends or an other character reap the benefits. This is in stark contrast with the social engineering macro which actually only motivates people to... play the game. 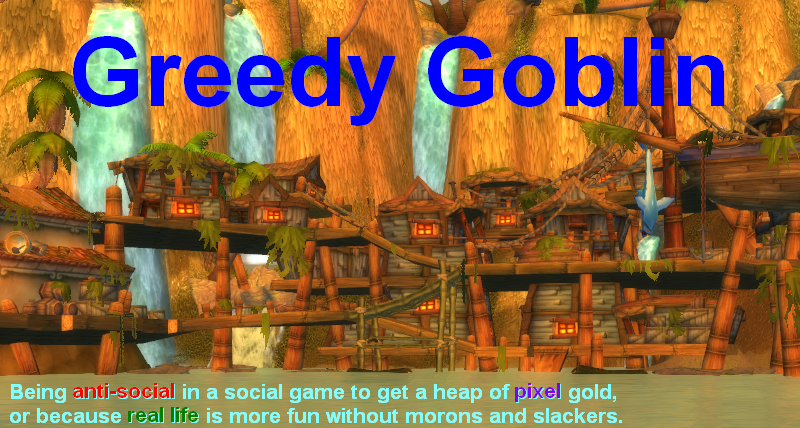 The guild also did not have enough players who wanted to actively participate. Person X logs on their horde character, joins TB queue. Person X's horde character is called for battle. Person X logs out the horde char in TB in the raid group, logs in to their alliance character, again joining TB queue. Person X's alliance character is called for battle. The horde now have e.g. 9 players with 1 offline. The alliance have 10 players with 0 online. The less people are queuing, the more effective this is. Also, if it is deliberate, then person X has more horde characters to log, or peers who'd like to participate in this exploitation. Game breaking bugs which involve game-play can and should be fixed. Game breaking bugs involving social engineering are not Blizzard's responsibility, and are much harder to fix. E.g. all the people who get hacked every day because they are stupid. Example of a mechanism which works against people from queuing unevenly is that one could queue and then not accept the queue. This means another person cannot join in that time span. This trick does not work for 2 reasons: there are only 20 seconds one can accept the queue so it'd be only effective for a short while. The other reason is that the selection process is random. Example of a mechanism which is still broken: this one, and MMR.